Welcome to the Drupal end-user guide. This tutorial assumes that you are using Drupal 7 or Drupal 8, or an older version of Drupal with sufficient modules installed to mimic some of the features that more recent versions offer. This tutorial aims to teach you the basics of how to edit your website and to answer some frequently asked questions. It's aimed at beginners and end-users, rather than web developers. We also provide an overview of how to write content for search engines. The exact layout and colour of the buttons will vary from site to site. Enter your web address, then go to the /user page, e.g. example.com/user. To edit a page simply click the Edit tab. If you wish to instead, create a new page, hover over 'Content' in the Administration menu (pictured below), then choose 'Add content' and the type of content you want to add (e.g. Page). After this the process is much the same to Edit or Add a page. By default this is the Title that appears both at the top of the page and the 'metatag' title which is used by search engines. On this page "Drupal tutorial - Drupal end user guide" is the title. The image below shows how this page appears in Google's search results. Which doesn't give either search engines or potential clients sufficient information about that page. The Metatags are also controlled at the bottom of the page, scroll down, then click 'Meta tags' and you will see the interface below. The Page Title is shown in the search results, by default it will be the same as the Title you enter at the top of the page, but if you want to override it, you can do so here. The Description is shown in normal text in the search results and appears under the Title, but does not appear on the page itself. Read more on how to write metatags. To add a page to a menu click 'Menu settings', then tick 'Provide a menu link'. Extra options then appear. Menu Link Title - What do you want the links TO this page, from other pages on your site to be called? (Fairly short Link Titles often work best, but should still be descriptive). Description - Hover over text that appears when someone hovers over the menu. Normally leave this blank. Parent Item - Where does this link appear on your site? The default is normally Primary Links, which is your main set of links, but you may have more than one set of links on your site. If you wish this page to be linked to as a sub-menu item from another page, select the relevant page it's a sub-menu of. Weight - Determines the order of links, ignore this for now, as there are easier ways of ordering links. Sometimes your site will be configured to automatically show the title of the page as a link (e.g. in a list of recent blog items), therefore manually adding a link may not be necessary. This determines the main content of a given page and uses the intuitive Drupal CK Editor interface, which is much like Word. View the complete CK Editor end-user guide. You may have multiple blocks (e.g. top, left, right and bottom) or image uploads and other options, in addition to your body field. Meta tags provide information about each page to search engines. The Description has little impact on your search engine position, so use the Description to sell yourself to people looking at a list of search results. The Description should encourage visitors to click your site, rather than someone else's, perhaps by listing unique selling points. Do not just put a list of keywords. Keywords - Google now ignores the Keyword metatag and has done for some time, perhaps put 3 or 4 keywords you want to appear high for, but otherwise you can ignore the Keyword metatag. (This doesn't mean they ignore keywords as a whole, just this particular metatag). To modify it, untick the 'Generate automatic URL alias' box, then change it. You're best using hyphens (minus signs) rather than underscores or spaces. If you change the URL, then we'll configure it so the old URL automatically redirects to the new one. If you're working on a page, but don't finish it in one go, click to expand 'Publishing Options', then untick 'Published'. This will mean that only site administrators will be able to see this page. To publish the page once you have finished it, simply tick 'Published' again. This is the most important button on the Create Content page - remember to press 'Save' once you've finished creating or editing a page! Alternatively, press 'Preview', which shows you what the page looks like, then scroll down to the bottom and press 'Save'. If your website's in development, it's often easier to use 'Save', then check the page after it's saved. I've created a page, but I can't see it, how do I find it again? 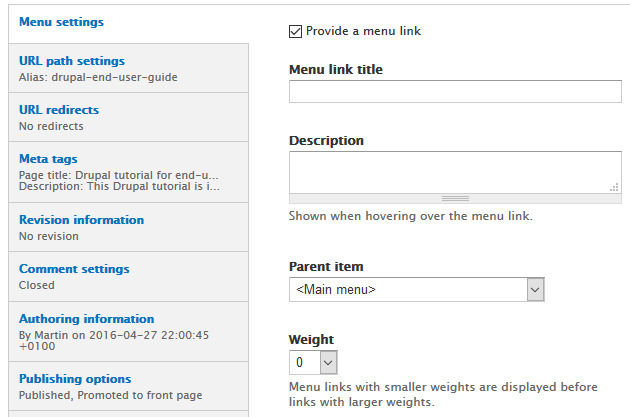 How do I change the order of links in Drupal? How do I edit other elements of a page (footers, headers, etc.)? How do I use tables in Drupal? How do I create a link that goes to a section of a page, not the top? How do I translate websites? If you've created a page, but either forgotten to add a link in the Menu Settings, or deliberately set it to 'unpublished', how do you find it again? This then lists all of the content on your site (including images). And simply drag and drop this menu item to wherever you want it to go. Repeat for other menu items, then press 'Save configuration'. In the Blocks section, you will then be presented with a list of 'Blocks' on your site - these may include things like Headers, Footers, auto-generated lists of content, menus, etc. The link to Site information is near the bottom right of the Administer page. This lets you edit the name of your website and the default email address, slogan, footer message and URL of the home page. If you feel you need to modify the theme, please contact 1 Website Designer first if possible, as this could change the site in unexpected ways. If you wish to modify for example a dynamically generated list, we may also have used Views, in which case please contact us and we'll explain how to modify these sections, or we'll modify them for you. The Microsoft Word software generates very poor html with several lines of code for every line of text that will slow down how quickly a page loads and means search engines have to wade through nonsense code to find the real content of a site. In Word / Excel Highlight the text you want to copy. Press Ctrl + C (on a PC) or Apple + C (on a Mac) to copy the text or Excel table. Open the Drupal page and position the cursor where you want to paste the text. Press the 'Paste from Word' button. Press Ctrl + V or Apple + V to paste it into the section that appears. If you accidentally paste from Word, my advice is to delete the content and restart. To see the html code that word creates, if you do this by accident press the Source button. Editing the html would be a whole new tutorial by itself, but this button also lets you look into the html code Drupal generates. We've created a whole page about working with tables in Drupal. How do I create a link to a section of page, rather than the top? This can be done using something called an anchor link, click to find out how these work. Creating links generally and 'anchor' links to a specific area of a page. The Drupal handbook refers to the latest version of Drupal and is aimed at developers rather than end-users or beginners. 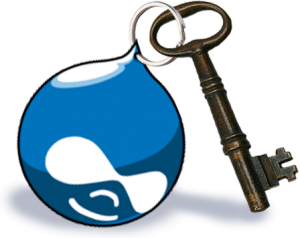 The benefits of Drupal gives you an overview of the key features of the CMS. Read about Indigoextra's Drupal web design service. If you're just looking into Drupal or into creating a new website, please browse the rest of this site, which has information on our Drupal web design and search engine optimization services, plus extra tutorials and advice.